As the crisis in Former British territory of Southern Cameroons (Cameroon’s North West and South West regions) swings into its third year without any clear roadmap as to what lies ahead, those fighting for the restoration of the statehood of Southern Cameroons have announced an all-inclusive peoples conference. With over 200 villages, more than 5000 civilians killed, about 60,000 in refugee camps, and more than 800,000 internally displaced, the organizers say there is a need to strategize and put in place a plan of action that will better the situation back home. The gathering to take place in Washington DC. on Friday, March 29 and 30, seeks to assembly various groups and fractions engage in the Southern Cameroons course so they can together map out a roadmap and strategy towards achieving their objectives. 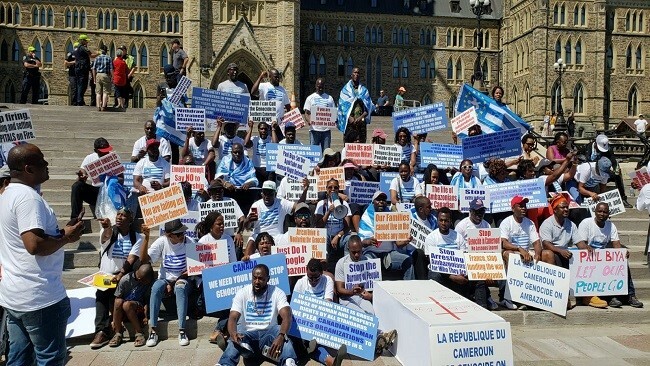 “This conference will enable Southern Cameroonians to “speak with one voice; to express what they want and to summon the international community to take its responsibility before history,” its organizers hold. In a chat with this reporter, erstwhile Secretary General of the outlawed Cameroon Anglophone Civil Society Consortium, who is a member of the steering committee charged with organizing the conference, Dr. Fontem Neba said they have reached out to all engage in the fight for the liberation of Southern Cameroon. “We need to be united, to talk with one voice. That way we can better channel our grievances. It has been my prayer that we can find common grounds,” he said. Many who spoke to this reporter had high expectations for the conference expecting their desires that the various “leaders” will finally be united so the “struggle” can have a focus. In a statement sent to our newsroom, organizers of the confab say there is an urgent need for a peaceful solution to the crisis. This, they seek to achieve by bringing all the Southern Cameroonian stakeholders at home and in the diaspora together to chart, by consensus, a peaceful way out of the bloody conflict. “The Conference will bring together all Southern Cameroonians around the same table to: Identify the problems which have plagued their existence since they obtained independence by joining the Republic of Cameroon in 1961,” the statement read. “We expect that the resolutions adopted at the end of the conference must be arrived at in a consensual or democratic manner free from rancour and should elicit our common determination to end the people’s suffering. In all, the conference is a proof of the maturity of Southern Cameroonians and their readiness to chart a peaceful way forward,” he said.